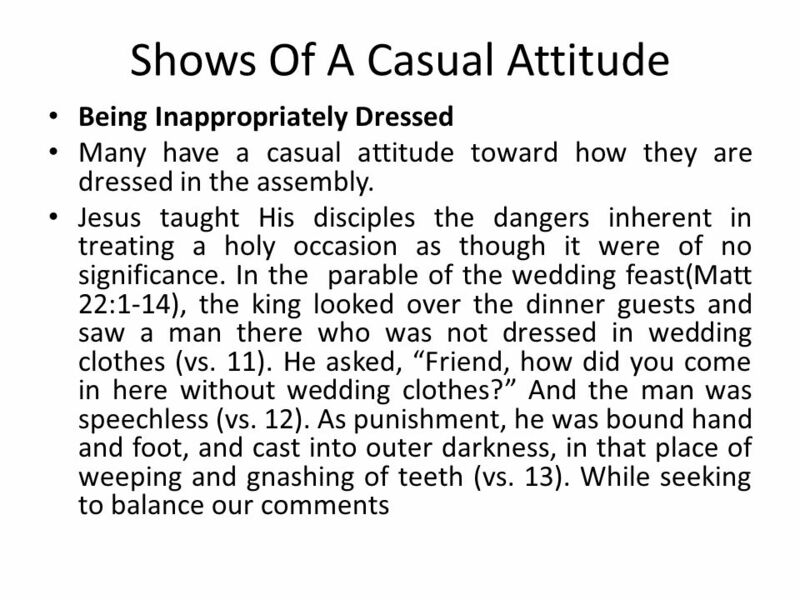 Casual Attitudes In Our Worship Does This Sound Familiar? It is time to go to services to worship the Lord on Sunday. You get up rush around after sitting. 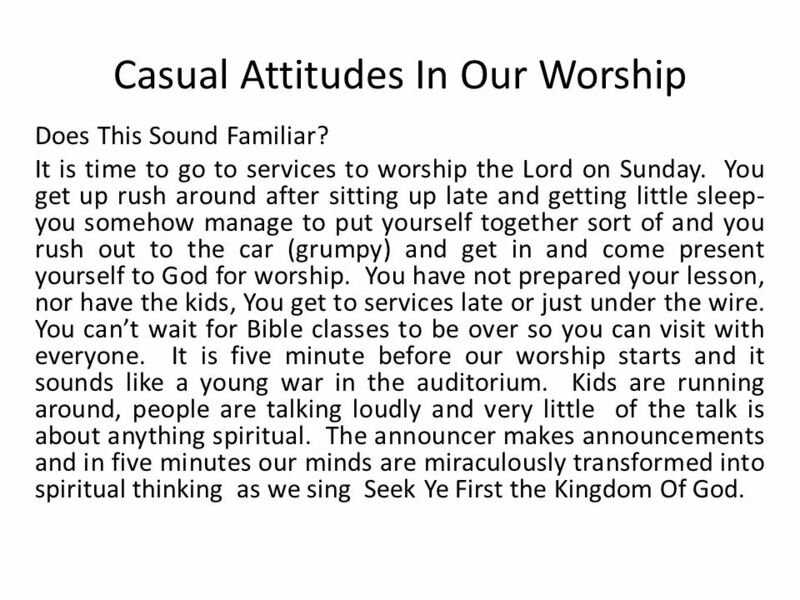 1 Casual Attitudes In Our Worship Does This Sound Familiar? It is time to go to services to worship the Lord on Sunday. You get up rush around after sitting up late and getting little sleep- you somehow manage to put yourself together sort of and you rush out to the car (grumpy) and get in and come present yourself to God for worship. You have not prepared your lesson, nor have the kids, You get to services late or just under the wire. You cant wait for Bible classes to be over so you can visit with everyone. It is five minute before our worship starts and it sounds like a young war in the auditorium. Kids are running around, people are talking loudly and very little of the talk is about anything spiritual. The announcer makes announcements and in five minutes our minds are miraculously transformed into spiritual thinking as we sing Seek Ye First the Kingdom Of God. 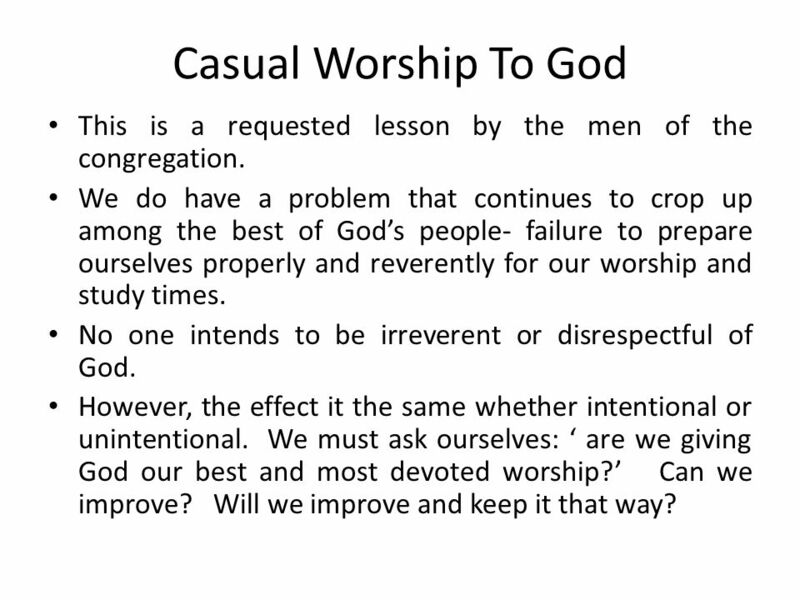 2 Casual Worship To God This is a requested lesson by the men of the congregation. We do have a problem that continues to crop up among the best of Gods people- failure to prepare ourselves properly and reverently for our worship and study times. 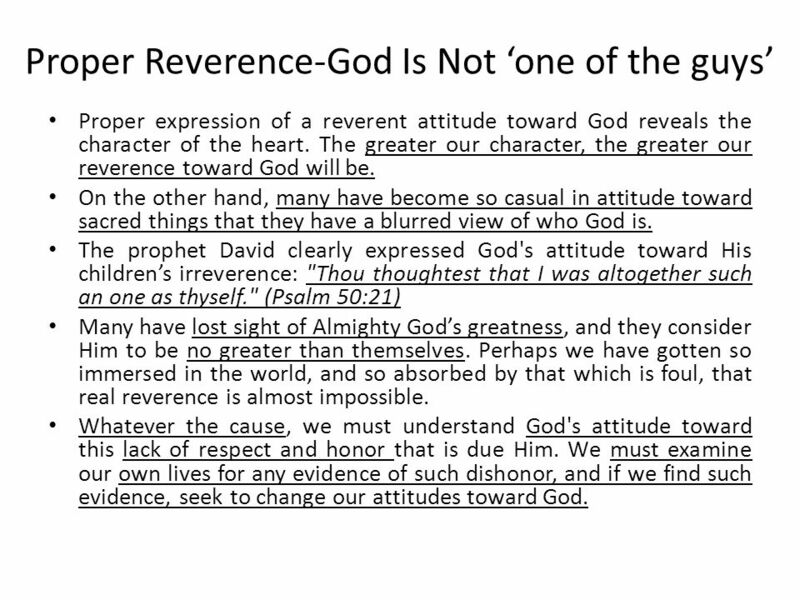 No one intends to be irreverent or disrespectful of God. However, the effect it the same whether intentional or unintentional. We must ask ourselves: are we giving God our best and most devoted worship? Can we improve? Will we improve and keep it that way? 4 Worship & Service All Worship is service but not all service is worship. There is a difference in our worship to God and our daily service as Christians among the people of the world. 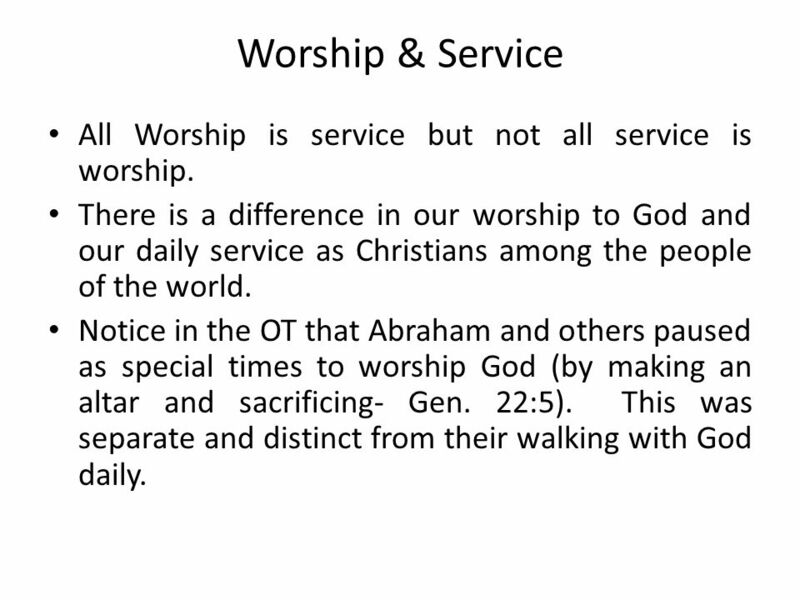 Notice in the OT that Abraham and others paused as special times to worship God (by making an altar and sacrificing- Gen. 22:5). This was separate and distinct from their walking with God daily. 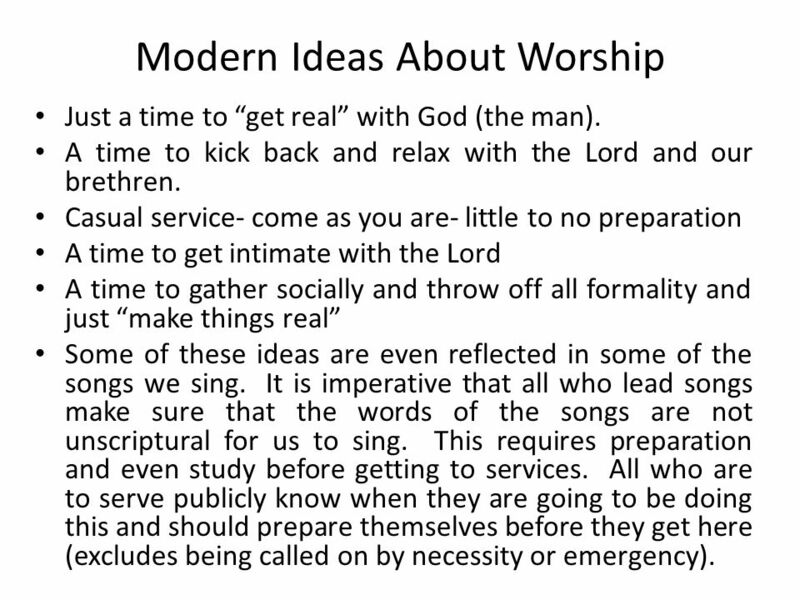 5 Modern Ideas About Worship Just a time to get real with God (the man). A time to kick back and relax with the Lord and our brethren. Casual service- come as you are- little to no preparation A time to get intimate with the Lord A time to gather socially and throw off all formality and just make things real Some of these ideas are even reflected in some of the songs we sing. It is imperative that all who lead songs make sure that the words of the songs are not unscriptural for us to sing. This requires preparation and even study before getting to services. All who are to serve publicly know when they are going to be doing this and should prepare themselves before they get here (excludes being called on by necessity or emergency). 6 We Must Remember Who God Is When we worship we are in the presence of the Almighty God. Deity is in our midst and we are the servants. We are to offer our very best to The Creator of all things. Reverence is defined as "a feeling or attitude of deep respect, love, awe, and esteem, as for something sacred; veneration." 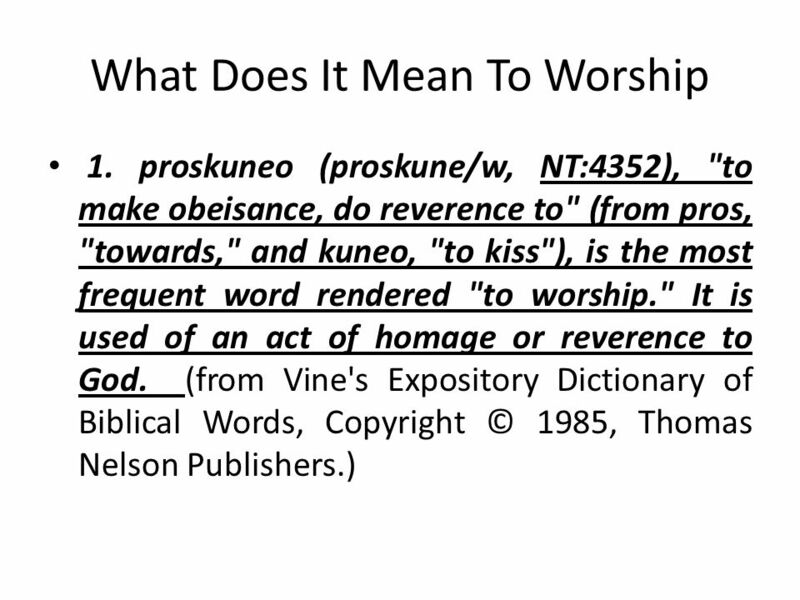 Some of the synonyms for reverence are "honor, veneration, awe, adoration." 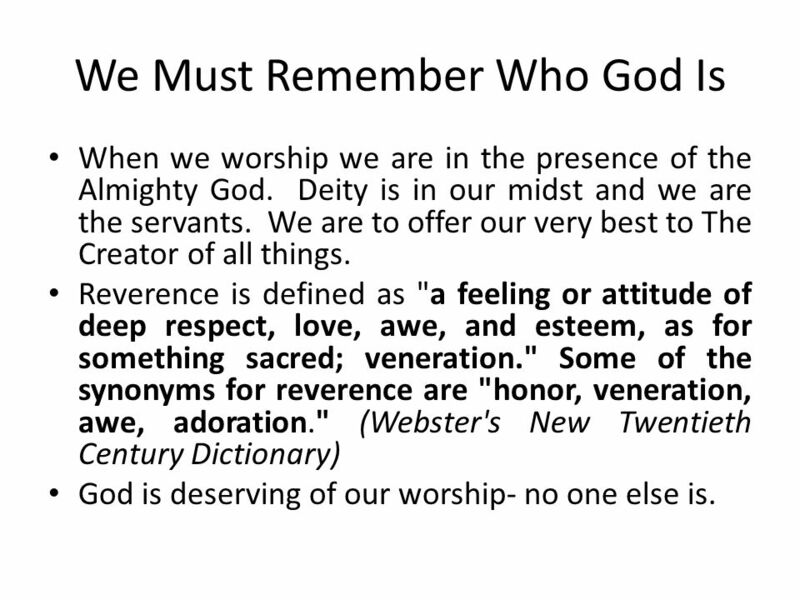 (Webster's New Twentieth Century Dictionary) God is deserving of our worship- no one else is. 7 Passages That Show Proper Reverence Ps 95:6-7 6 O come, let us worship and bow down: let us kneel before the Lord our maker. 7 For he is our God; and we are the people of his pasture, and the sheep of his hand. Ps 96:9 O worship the Lord in the beauty of holiness: fear before him, all the earth. Matt 4:10 Thou shalt worship the Lord thy God, and him only shalt thou serve. John 4:23-24 23 But the hour cometh, and now is, when the true worshippers shall worship the Father in spirit and in truth: for the Father seeketh such to worship him. 24 God is a Spirit: and they that worship him must worship him in spirit and in truth. 8 Spirit And Truth Worship The Psalmist, when speaking of God, said: "I will extol thee, my God, 0 King: and I will bless thy name forever and ever." (Psalm 145:1) David expressed a proper attitude toward God. Jesus, when instructing the disciples how they ought to pray, taught them to address God, "Our Father who art in heaven, "Hallowed be thy name." (Matthew 6:9) Jesus taught that any approach to God should be with reverence and awe. 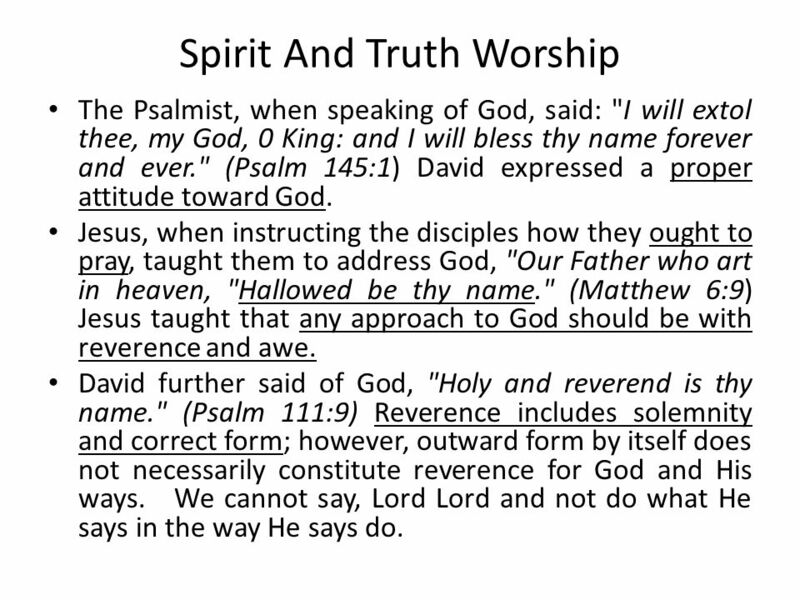 David further said of God, "Holy and reverend is thy name." (Psalm 111:9) Reverence includes solemnity and correct form; however, outward form by itself does not necessarily constitute reverence for God and His ways. We cannot say, Lord Lord and not do what He says in the way He says do. 9 Proper Reverence-God Is Not one of the guys Proper expression of a reverent attitude toward God reveals the character of the heart. The greater our character, the greater our reverence toward God will be. On the other hand, many have become so casual in attitude toward sacred things that they have a blurred view of who God is. The prophet David clearly expressed God's attitude toward His childrens irreverence: "Thou thoughtest that I was altogether such an one as thyself." (Psalm 50:21) Many have lost sight of Almighty Gods greatness, and they consider Him to be no greater than themselves. Perhaps we have gotten so immersed in the world, and so absorbed by that which is foul, that real reverence is almost impossible. Whatever the cause, we must understand God's attitude toward this lack of respect and honor that is due Him. We must examine our own lives for any evidence of such dishonor, and if we find such evidence, seek to change our attitudes toward God. 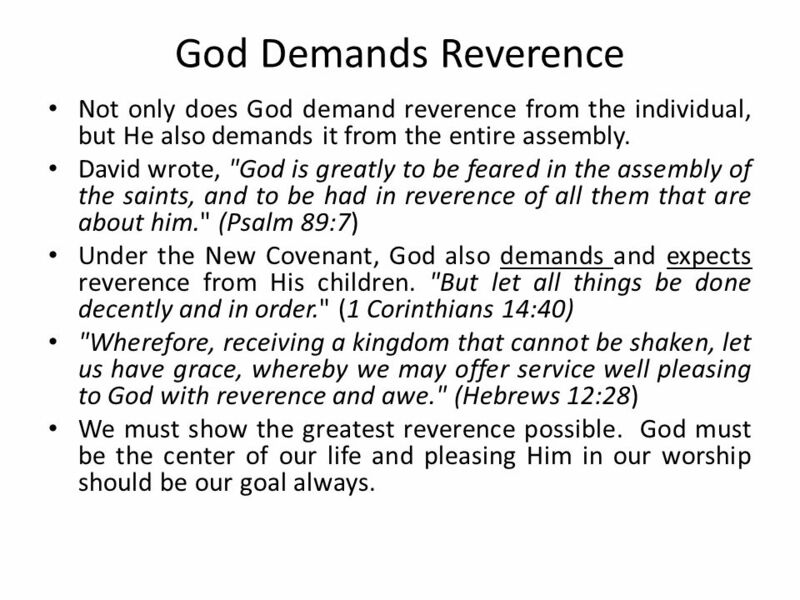 10 God Demands Reverence Not only does God demand reverence from the individual, but He also demands it from the entire assembly. David wrote, "God is greatly to be feared in the assembly of the saints, and to be had in reverence of all them that are about him." (Psalm 89:7) Under the New Covenant, God also demands and expects reverence from His children. "But let all things be done decently and in order." (1 Corinthians 14:40) "Wherefore, receiving a kingdom that cannot be shaken, let us have grace, whereby we may offer service well pleasing to God with reverence and awe." (Hebrews 12:28) We must show the greatest reverence possible. God must be the center of our life and pleasing Him in our worship should be our goal always. 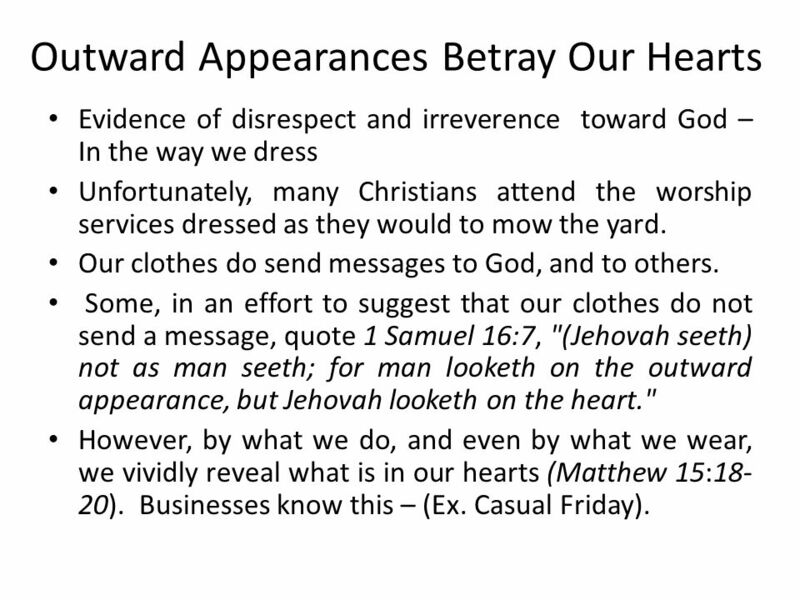 11 Outward Appearances Betray Our Hearts Evidence of disrespect and irreverence toward God – In the way we dress Unfortunately, many Christians attend the worship services dressed as they would to mow the yard. Our clothes do send messages to God, and to others. Some, in an effort to suggest that our clothes do not send a message, quote 1 Samuel 16:7, "(Jehovah seeth) not as man seeth; for man looketh on the outward appearance, but Jehovah looketh on the heart." However, by what we do, and even by what we wear, we vividly reveal what is in our hearts (Matthew 15:18- 20). Businesses know this – (Ex. Casual Friday). 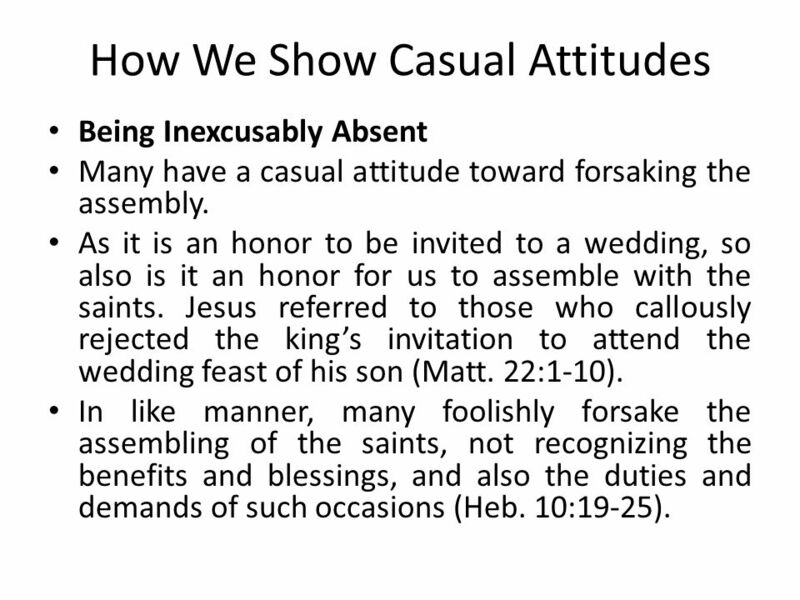 12 How We Show Casual Attitudes Being Inexcusably Absent Many have a casual attitude toward forsaking the assembly. As it is an honor to be invited to a wedding, so also is it an honor for us to assemble with the saints. Jesus referred to those who callously rejected the kings invitation to attend the wedding feast of his son (Matt. 22:1-10). In like manner, many foolishly forsake the assembling of the saints, not recognizing the benefits and blessings, and also the duties and demands of such occasions (Heb. 10:19-25). 13 Showing A Casual Attitude Being Perpetually Late Many have a casual attitude toward when they arrive at the assembly. Jesus said the kingdom of heaven is comparable to ten virgins, who took their lamps and went out to meet the bridegroom (Matt. 25:1- 13). Five were wise (bringing sufficient reserves) and five were foolish (lacking enough oil). Those who were ready entered with the bridegroom to attend the wedding feast; and the door was shut. When the foolish virgins arrived late, they desired admission, saying, Lord, lord, open up for us! Yet, they were denied admission. Why? Their late arrival would have been an unwelcome distraction to the celebration of the wedding feast. Just as we need to be ready for the Lords return, so also we need to be ready to participate in the Bible classes and the worship (Luke 12:35-40). A basic rule of life is, Be On Time! In business, one hears, If you are five minutes early, you are ten minutes late. Edification cannot occur in the midst of distractions (1 Cor. 14:26-33). 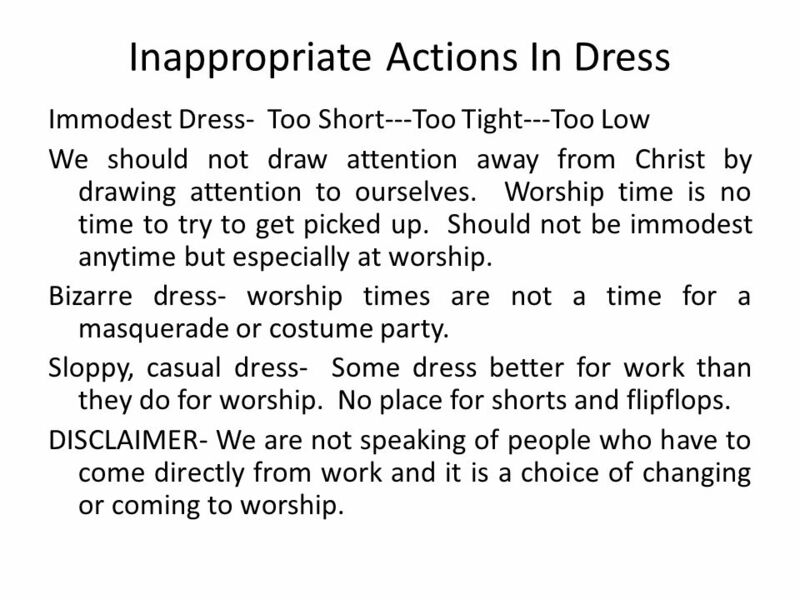 15 Inappropriate Actions In Dress Immodest Dress- Too Short---Too Tight---Too Low We should not draw attention away from Christ by drawing attention to ourselves. Worship time is no time to try to get picked up. Should not be immodest anytime but especially at worship. Bizarre dress- worship times are not a time for a masquerade or costume party. Sloppy, casual dress- Some dress better for work than they do for worship. No place for shorts and flipflops. DISCLAIMER- We are not speaking of people who have to come directly from work and it is a choice of changing or coming to worship. 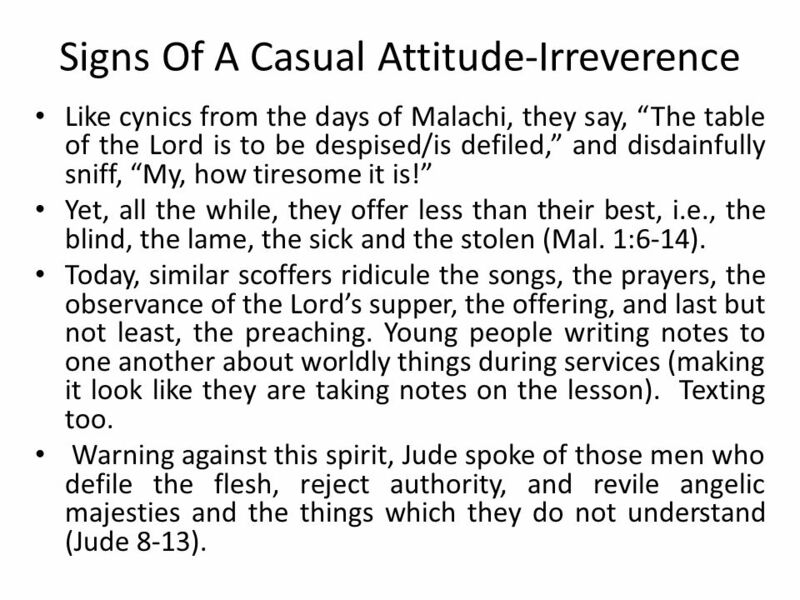 16 Signs Of A Casual Attitude-Irreverence Like cynics from the days of Malachi, they say, The table of the Lord is to be despised/is defiled, and disdainfully sniff, My, how tiresome it is! Yet, all the while, they offer less than their best, i.e., the blind, the lame, the sick and the stolen (Mal. 1:6-14). Today, similar scoffers ridicule the songs, the prayers, the observance of the Lords supper, the offering, and last but not least, the preaching. Young people writing notes to one another about worldly things during services (making it look like they are taking notes on the lesson). Texting too. Warning against this spirit, Jude spoke of those men who defile the flesh, reject authority, and revile angelic majesties and the things which they do not understand (Jude 8-13). 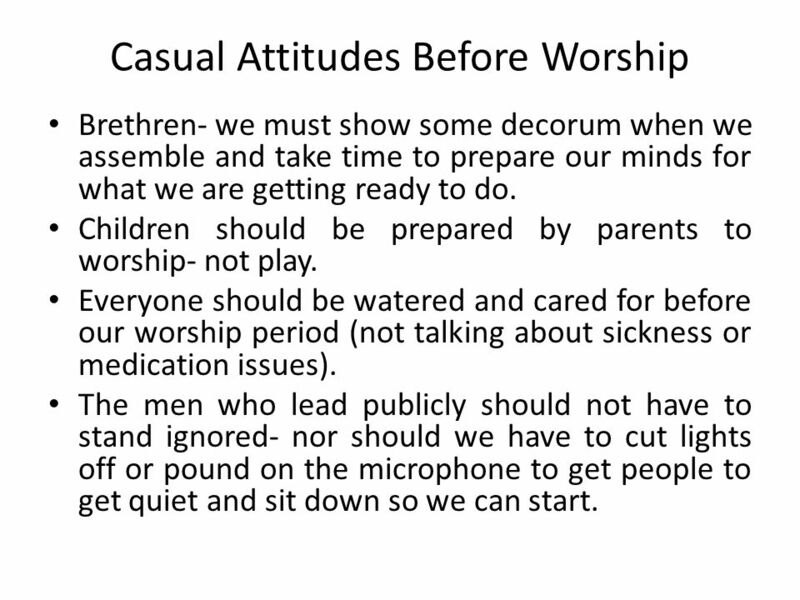 17 Casual Attitudes Before Worship Brethren- we must show some decorum when we assemble and take time to prepare our minds for what we are getting ready to do. 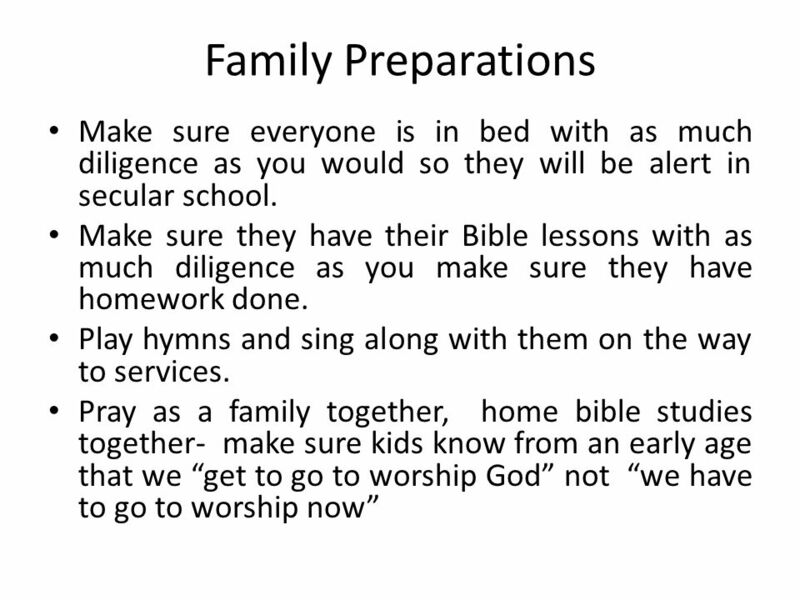 Children should be prepared by parents to worship- not play. Everyone should be watered and cared for before our worship period (not talking about sickness or medication issues). The men who lead publicly should not have to stand ignored- nor should we have to cut lights off or pound on the microphone to get people to get quiet and sit down so we can start. 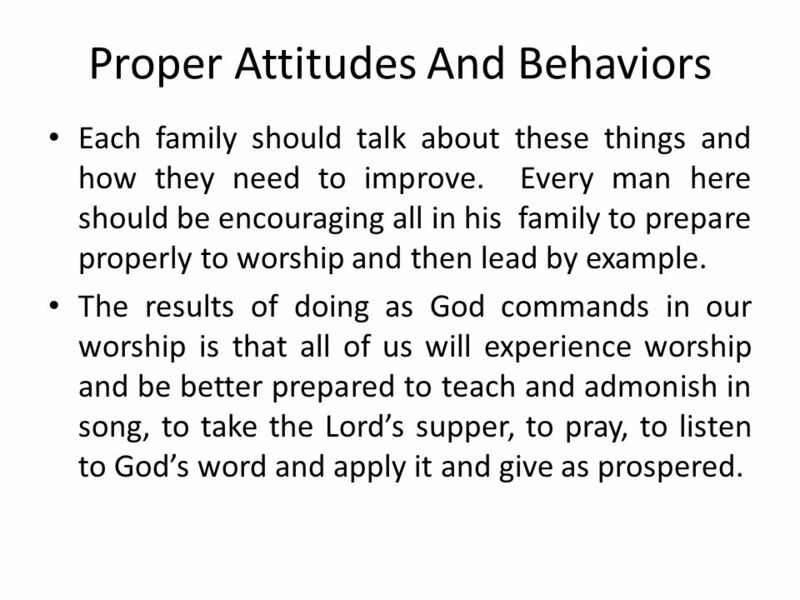 18 Proper Attitudes And Behaviors Each family should talk about these things and how they need to improve. Every man here should be encouraging all in his family to prepare properly to worship and then lead by example. The results of doing as God commands in our worship is that all of us will experience worship and be better prepared to teach and admonish in song, to take the Lords supper, to pray, to listen to Gods word and apply it and give as prospered. 19 Suggestions All men who serve publicly prepare for what you are to do. Announcements can be scrolled on powerpoint if received on time. 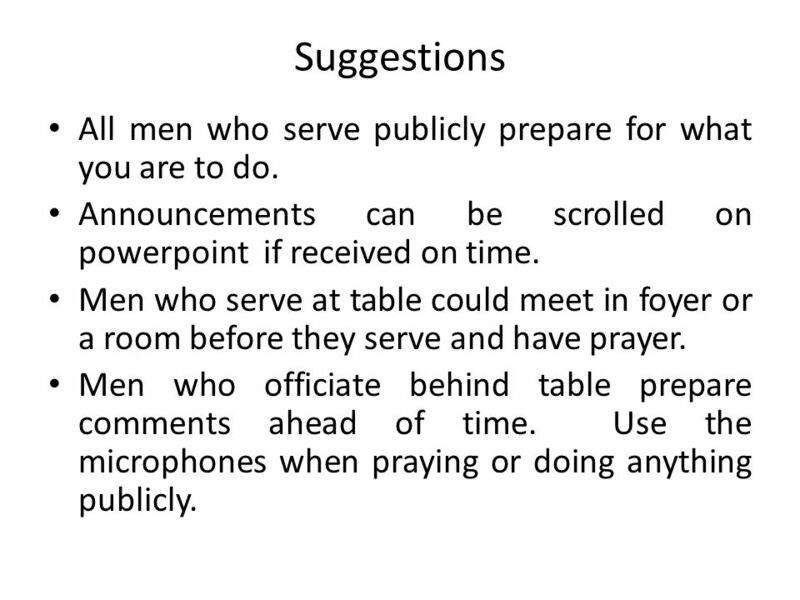 Men who serve at table could meet in foyer or a room before they serve and have prayer. Men who officiate behind table prepare comments ahead of time. Use the microphones when praying or doing anything publicly. 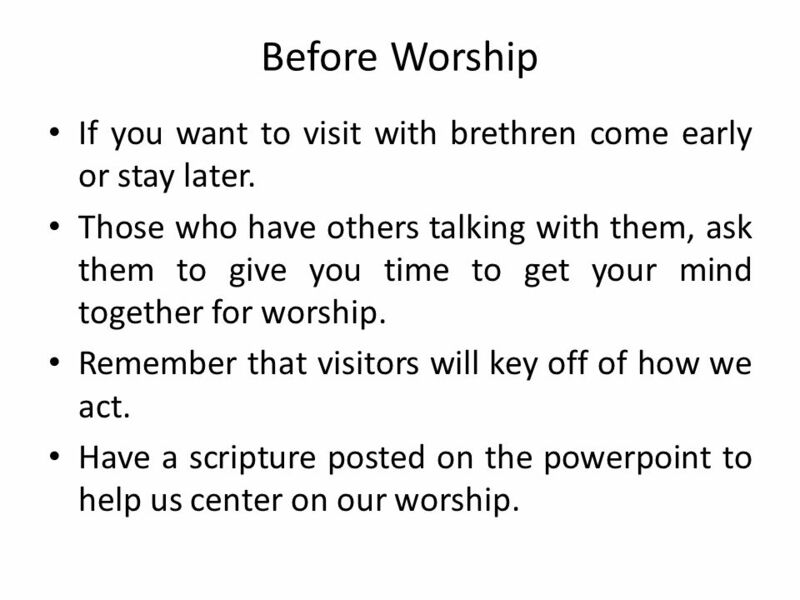 21 Before Worship If you want to visit with brethren come early or stay later. Those who have others talking with them, ask them to give you time to get your mind together for worship. Remember that visitors will key off of how we act. 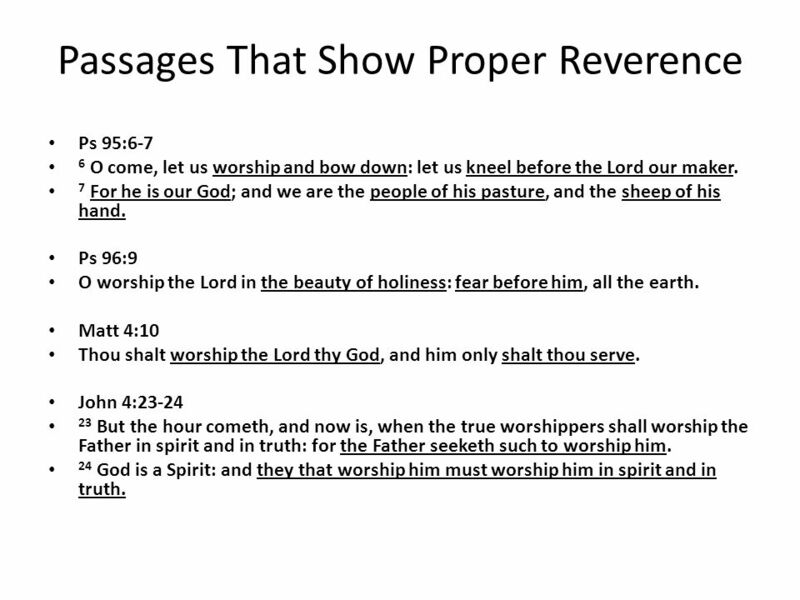 Have a scripture posted on the powerpoint to help us center on our worship. 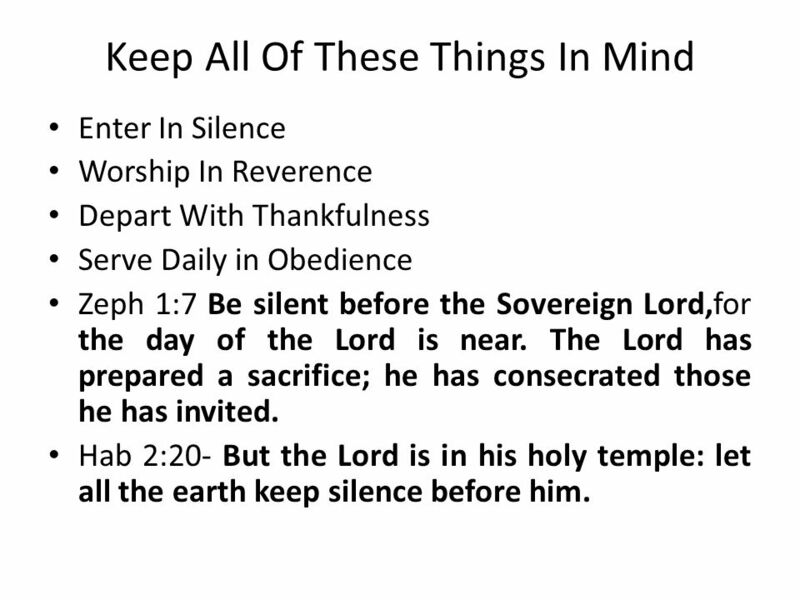 22 Keep All Of These Things In Mind Enter In Silence Worship In Reverence Depart With Thankfulness Serve Daily in Obedience Zeph 1:7 Be silent before the Sovereign Lord,for the day of the Lord is near. The Lord has prepared a sacrifice; he has consecrated those he has invited. Hab 2:20- But the Lord is in his holy temple: let all the earth keep silence before him. 23 Give Of Your Best To The Master Give of your best to the Master; Give of the strength of your youth; Throw your souls fresh, glowing ardor Into the battle for truth. Give of your best to the Master; Give Him first place in your heart; Give Him first place in your service; Consecrate every part. Give of your best to the Master; Naught else is worthy His love; He gave Himself for your ransom, Gave up His glory above. Laid down His life without murmur, You from sins ruin to save; Give Him your hearts adoration; Give Him the best that you have. 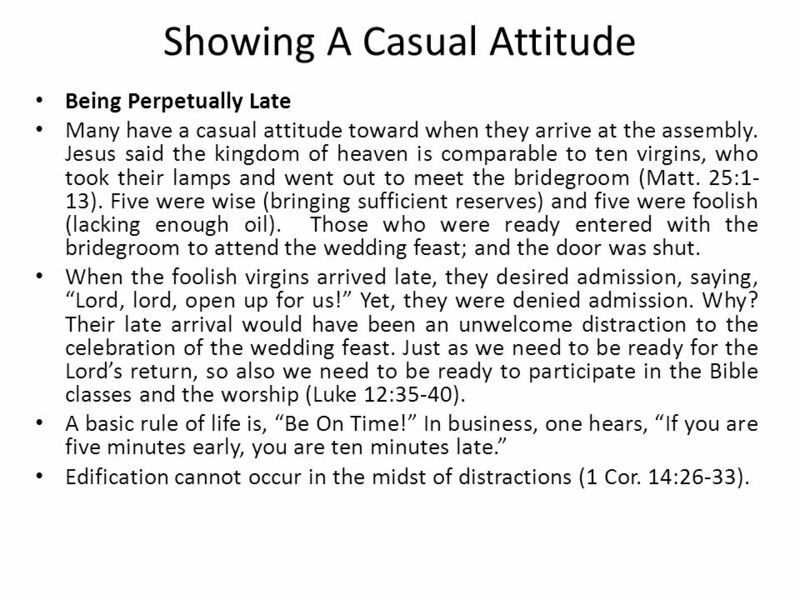 Download ppt "Casual Attitudes In Our Worship Does This Sound Familiar? It is time to go to services to worship the Lord on Sunday. You get up rush around after sitting." …. The Parable Of The Wedding Feast Matthew 22:1-14. 1 W. 65th St church of Christ / June 15, 2008 Don McClain.